Great bowls, great soups and a great cause. 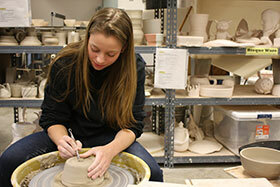 That is the recipe for another great Empty Bowls event that will take place from 5-7 p.m. March 31 in Whitewater Hall. It’s a special time to “dine together and raise awareness for hunger relief in the area,” said coordinator Carrie Longley, assistant professor and chair of the fine arts department at IU East. “Portal for the Agrarian” by Greg Mueller. 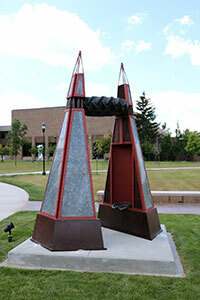 Six new sculptures are now a part of the Indiana University East landscape. The pieces for the Outdoor Sculpture Exhibit began arriving July 23 for installation. 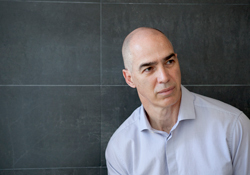 Indiana University East will present a Mindful Explorations lecture by Steve Prescott from 3-5 p.m. on Friday, March 27, in Tom Raper Hall Room 124. The event is free and open to the public. The lecture is sponsored by Mindful Explorations, courtesy of the William H. and Jean R. Reller Endowment. Piedad Llerena moves through life like a perpetual Christmas present: If you take off one wrapping, you’ll find another gift. Take off another wrapping, you’ll find another gift. And then another. And another. Call them messages in a soup bowl. 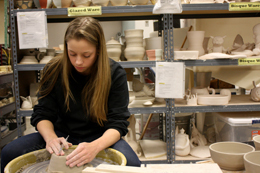 Students have been creating unique ceramic bowls by the dozens in the studio at Indiana University East. Hour by hour, over 200 pottery pieces have been thrown on the pottery wheel, fired, glazed and fired again. Indiana University East is accepting art entries October 6-10 for the 2014 Whitewater Valley Annual Art Competition (WVAAC). The competition will begin at 2 p.m. on Saturday, October 18, in Whitewater Hall. Prior to the judging, there will be a juror presentation at 11:30 a.m. in Tom Raper Hall, room 124.